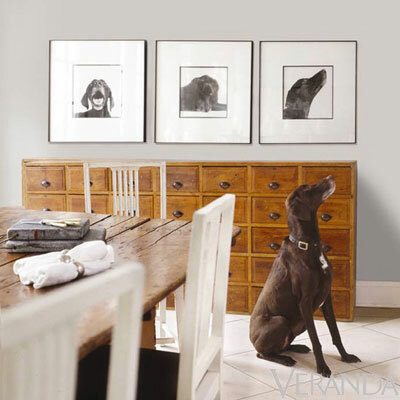 Darryl Carter is one of my favorite designers for making antiques look so fresh and modern. The June issues of Veranda and Elle Decor both feature him in inspiring ways. In each of these rooms you can see the wonderful use of high and low antiques to create a modern space. He prefers light colored walls to set off the browns of the furniture, and it works (even though I am a color girl when it comes to wall paint!). The top photo has several more refined antiques including what I almost consider signature pieces for his designs - the regency sofa and round table. In the middle photo he uses very rustic pieces to wonderful effect. The bottom photo features a cabinet that you might have found in an old shop. Two nice options for the table are these two Louis Philippe mahogany center tables coming up at auctions. The one on the left is in the next Doyle New York auction June 6th. This is Lot 663, and has an auction estimate of $800 - $1,200. This one on the right is quite similar, but has the nice addition of a marble top. I like marble for hard wear. You won't worry about putting drinks on it, or scratching. This is in the next auction at Kamelot Auctions in Philadelphia June 9th. It's Lot 47 and has an auction estimate of $600 - $900. For a similar settee, I like this George III late 18th century painted satinwood settee that sold at a Christie's auction in New York. It has lovely detailing on the top which adds a lot of interest. If you want a really fresh look, upholster it in a white canvas. This sold for $2,500 off an auction estimate of $1,000 - $1,500. This one was a real bargain. This also sold at a Christie's sale with the same estimate of $1,000 - $1,500, but for only $375!. 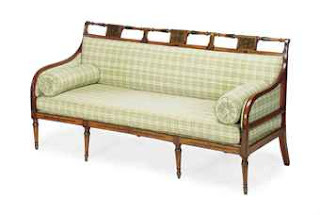 This is a mid-19th century French provincial fruitwood settee. 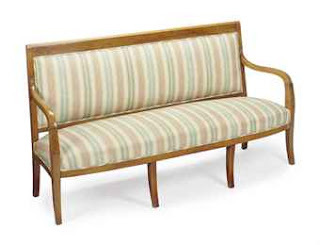 Again, I would upholster it in white canvas for an updated look. 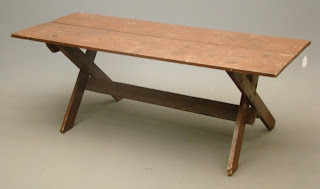 I love Copake Auction in Copkae, NY for Americana and rustic furniture. This 19th century sawbuck work table would serve nicely as a kitchen dining table, or as the console table like the middle photo. This sold for $150 off an auction estimate of $200 - $400. 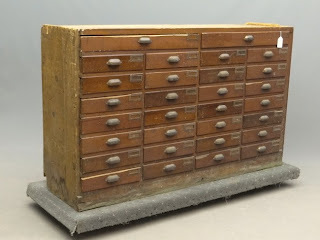 For a shop cabinet with lots of drawers, here is a 19th century hardware store cabinet that also sold at a Copake Auction. This sold for $300 off an auction estimate of $250 - $350. 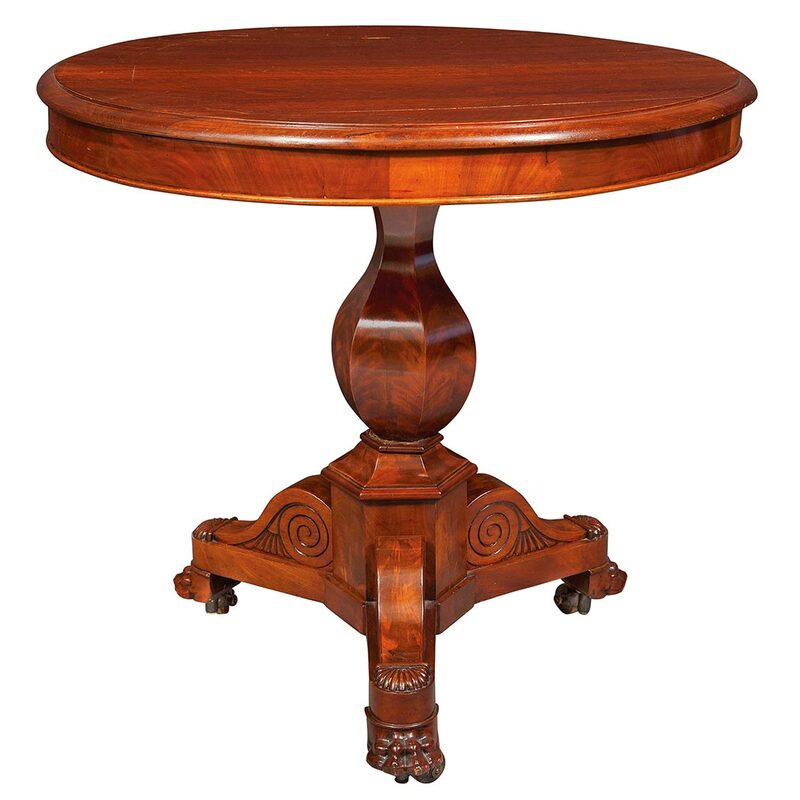 You could leave this in worn rustic condition, or polish it up for a more refined look. Darryl Carter has the touch that makes antiques fresh and modern. Auctions are a great place to replicate his look. Just paint the walls white, re-upholster the furniture in white canvas, and let the warm woods pop! I would need to add a little color, but that's what pillows are for! Try red!! 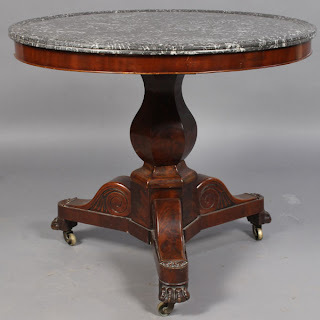 Great information about antiques as it has historical look and it is the philosophy of art and the above discussed was very useful as I have passionate about antiques and I have been looking for the similar kind of information.Thanks for the information.